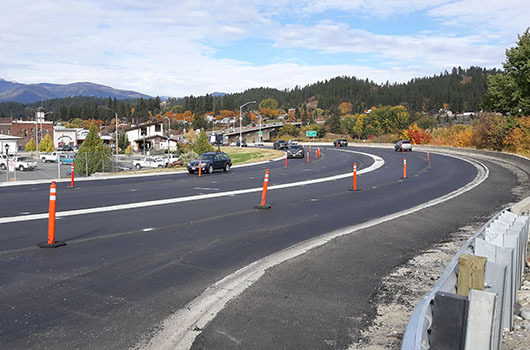 From 2018: Traffic flows through construction on US-95 near the Kootenai River Bridge in Bonners Ferry. During the month of March, work on the east side of US-95 from Madison Street to Alderson Lane will relocate utilities in advance of paving. In the next few weeks, crews will remove some of the sidewalks and drainage infrastructure. Some trees will be cleared away, and the vacant building near Lincoln Street will be demolished. This work could require some temporary lane closures, but the major roadway impacts for the season are expected to start in April and last until October. Once paving starts, one lane will remain open in each direction. Any nighttime work will allow alternating, one-way traffic. Sidewalks will be closed for the duration of the project, and city street intersections will be closed temporarily as they are reconstructed. The signal at Alderson Lane will be removed later this year. Work this season will wrap up the initial stage of reconstruction from the Kootenai River Bridge to Alderson Lane. Work from Alderson Lane to Labrosse Hill Street is scheduled to start in 2022 and end in 2023. After construction, there will be a continuous three-lane section through town complete with pedestrian facilities.